A man of astonishing complexity any attempt to encompass and profile him is bound to fail. 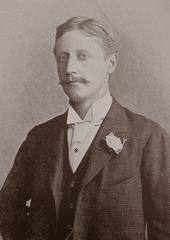 Born on 27th January 1860, the heir to his father and 3rd Baronet, Sir Reresby, he succeeded in April 1862. His mother and now Dowager Lady Louisa, was in a sense homeless, her life more onerous as she inherited the debts and financial collapse which led to the closing of the ancestral Renishaw Hall some time between 1842 and 1846. Coming to Scarborough she occupied the newly built "Sunnyside", a villa on the corner of Ramshill and Westbourne Grove, in 1867. Accompanied by her son and his elder sister Florence she soon moved to Wood End, a villa owned by the family from 1870 to 1934. Sir George completed his education at Eton and Oxford, and was soon immersing himself in politics, architecture, local history and genealogy, having shown a scholastic and forensic mind. Becoming MP for Scarborough from 1885-86 and then 1892-95 as a staunch Conservative he would, in the 1919 election, campaign for his son Osbert under a Liberal banner. The key to his character is to understand that he had a huge capacity for isolation. The knowledge that his Scottish ancestors had lived with and off the Sitwells at Renishaw and were part of the financial downfall, led him to believe "that it is always a mistake to have friends". Since he was a man who "always knew best", this too was hardly the framework for a successful marriage. So it proved. The marriage ceremony in London on 26th November 1886 was followed three days later with the bride rushing back to mother. At seventeen years of age she was vastly underprepared, and the former Lady Ida Denison, daughter of Baron Londesborough, soon to be an Earl, had to contend with a man whose fixed ideas she would have to live with till her death in 1937. Sir George and Lady Ida would live first at Wood End, where their first child Edith was born in 1887, and later in 1892 moved to Belvoir House in Belvoir Terrace just across the Crescent. At this time too a future butler to Sir George would come into their service. This was Henry Moat, a man who would later accompany his master on almost a daily basis. "Almost" it has to be since they fell out on occasions, but each could not do without the other. Henry's letters to the family, written during his retirement, are a model of blunt earthy prose and are suffused with obvious admiration and affection. Moving back to Wood End in 1902, Sir George had already suffered a breakdown in health. He began travelling, especially to Italy, where in 1908 he purchased a Castle, Montegufoni. It would later feature as a focus away from Renishaw, remaining in the family until sold by the then Baronet Reresby in 1974. Structural alterations to Wood End included a major extension overlooking the Valley, by which a library and bedroom (for Osbert) were created. At Renishaw Sir George renovated the gardens and structured a major lake, the practical planning of a man who in 1908 published a book entitled "On The Making Of Gardens". As Italy entered the Second World War Sir George left it too and had to escape to Switzerland, where he died at Locarno on 8th July 1943. A man largely misunderstood, a figure of fun to his children, he bore many disappointments and deserves some quiet admiration.